I purchased two of these shackles for use in automotive recovery/off-roading. They arrived in a padded shipping package and were individually bubble wrapped ensuring no chips/scuffs. The epoxy coating holds up to knocking, clanging, dropping onto cement and chain pulling without so much as a scratch – far stronger than powder coat or paint. The pin & shackle threads are cut with coating tolerance in mind resulting in a smooth mating with no burs/interference. Once fully threaded the shackle feels very secure with no chance of rattling or knocking loose. I personally prefer this type of threaded pin over shackle pins secured with cotter pins. The SWW is raised onto the shackle for easy identification. 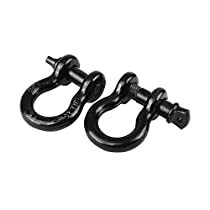 Although it did not come with certificates or QA paperwork these shackles look, feel, and perform like top of the line Crosby products I use for work but are offered at a much more reasonable price point. These are perfect for anyone with bumper mounted pad eyes, tow straps, winches, and would be equally suitable for marine applications too. I have received this product at a discount in exchange for an honest review. I am rating this product as if I paid full price and have not lowered my expectations. I had my wife order me a set of the 7/8 Shackles for my F-250. This is the pair that she ordered for me and I am very happy that she choose these. They are definitely heavy duty, but I would expect that from any good shackle. What makes these stand out is the powder coat finish. The finish is amazingly strong. I haven't scratched it or dinged yet and after a few uses these still look like new. Now my wife did receive a small discount on this product in exchange for my honest unbiased review. However, these thoughts and opinions are entirely my own and were not influenced by her purchase price or any discount received to buy and review this item.